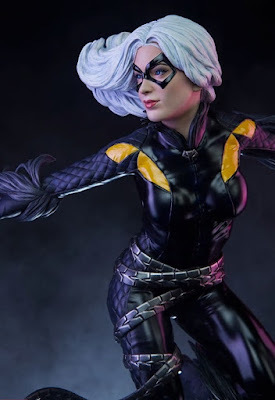 She's Fantastic: Marvel Legends - BLACK CAT! Marvel Legends - BLACK CAT! 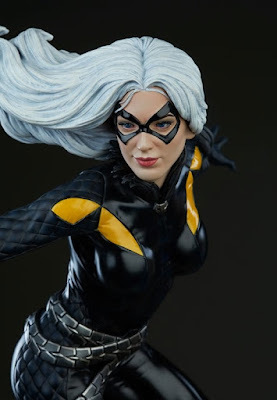 With all the great Marvel heroines who have yet to be immortalized in plastic, it's hard to justify a character getting a second figure within five years. 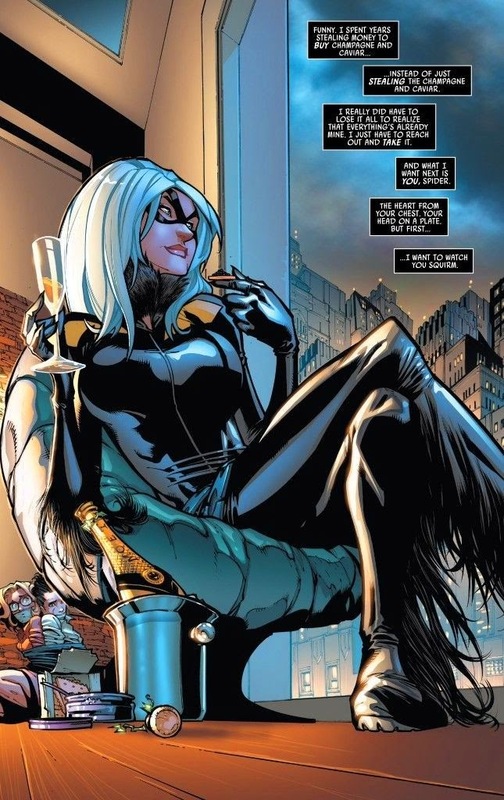 Even sticking to the Spider-Man theme, the fact that we don't have a Firestar or a Julia Carpenter yet is shocking (Not to mention all the awesome second and third-stringers like Lady Spider, Madame Web, Mania, Charlotte Witter, etc). 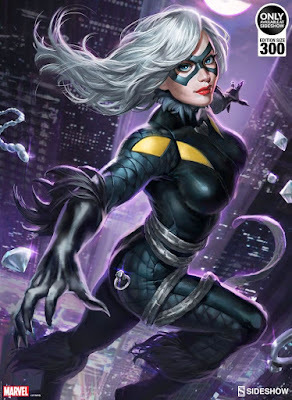 But I know the (now cancelled) Silver & Black movie meant we would be getting Silver Sable and Black Cat, and that Felicia would need a costume variation since her 2014 figure still holds up nicely. My initial reaction to her new look wasn't a positive one (I first saw it with her 2017 Minimate). But the weird cat eyes on her jacket are kind of winning me over. 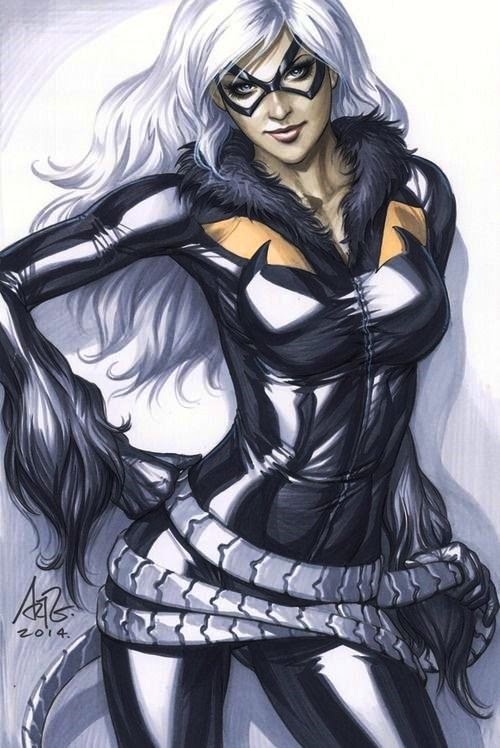 Plus I was always 50/50 on the big puffy white details on her classic look. Sometimes I thought it cool, and other times I thought it was ridiculous. At the very least, this new look retains a lot of the same elements while being much more utilitarian. Let's check out Black Cat below! Initially I didn't like anything about this figure. But after photographing her and researching the costume, I realize that 90% of my issues deal with her head. Sculpting an exaggerated facial expression is always risky. In this case, her grin looks creepy because it doesn't quite match the eyes. I feel like she needs a cocked-eyebrow expression (even though her mask covers her eyebrows). Oh, and her hair looks like a flat plastic blob. Felicia comes with a pretty frightening looking metal jointed whip. This thing seriously looks like it could tear a limb off. She comes with the build-a-figure pieces of Kingpin's Right Arm and diamond-topped sceptre. In researching this costume I came across this gorgeous Sideshow statue. It makes me really appreciate the new look. Here she is with her wave-mate, Silver Sable. And here she is with her classic 2014 Marvel Legends figure. Still looking for this one. Interesting costume change. Don't read the comics so didn't know about it. Neat design.